Through the way we dress, we can show the world who we are. There is little else we use as widely to express identity and social acceptance than fashion. We translate our whole lifestyle into choices of attire. Even our emotional state is something we express through clothing. So, it is no wonder that we feel highly emotional not only about the clothes we already have but also about the clothes we buy. Each purchase is a manifestation of ourselves; of who we are and want to be from here on. When brands and retailers want to gain market share and increase sales and footfall, this must be taken into account. The places where we buy clothes have long since started to shift. A while back, shopping for clothes was something that required us to hit the high street or a shopping centre. For many, this meant the often dreaded act of pushing through crowds of people on a Saturday afternoon. Always in competition with other shoppers, each looking for their own piece of identity. And all too often the result wasn’t as desired. Finally, you would find the perfect piece that really resonates with you and comes at the right price. But then the correct size wouldn’t be in store. Of course, the shop would be able to order it in for you – but the mere thought of starting this odyssey again would run a chill down your back, so you drop it. You go somewhere else in hope of better luck, starting the quest again. Sounds familiar? To many it does. Hence, it is no wonder that the e-commerce sector in fashion retail reports record profits while many high street fashion retailers close branches. Recent forecasts say that by 2022, the e-commerce segment of fashion and apparel will have increased at a compound rate of 10.6% from $408 billion (2017) to more than $706 billion. The number of potential customers is projected to grow to more than 1.2 billion by 2020. These new consumers are expected to have solid buying power and to be within the 16 to 24 and 25 to 34 age groups. What’s important to recognise is that these new consumers will set the bar high when it comes to the customer experience they expect. 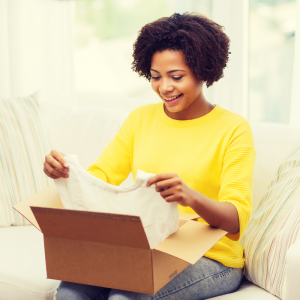 Today’s online shopping experience is one that outperforms the journey to the high street store in many ways. Virtual dressing rooms let you try on clothes; if you are not 100% sure about the size, you can easily order a few of them and return unwanted items for free. When you enter a physical shop, it is highly unlikely that the shop assistant knows who you are and what you like, let alone find time for you. When you enter an online shop however, you can expect instant and constant support at all times. Even better, based on your former purchases and previous online behaviour (keyword: retargeting), the shop will already know what you like. This is a type of customer experience that high street retailers cannot match. The effect of this highly personalised experience is that we feel recognised and valued as individuals. We feel that this important purchase which is to express our identity and lifestyle to the world around us for some time to come, is in tune with who we want to be: individuals with unique lifestyle choices. The above has wide implications on the deploy of strategic marketing tools in today’s fashion and apparel industry. Neither fashion retailers, on- or offline, nor fashion brands, new or established, can ignore these consumer values and related expectations. The answer is to respond with an even better experience that transcends from mere shopping and customer satisfaction to a holistic experience that promotes brand advocacy. There has been extensive research across hundreds of brands in dozens of categories which has shown that it is the connection on an emotional level that proves to be the most effective way to maximise customer value. For apparel this means that we need to utilise the inherent element of identity and lifestyle and translate it into something that connects it with a holistic brand experience. Ideally one that can express individual lifestyle as much as the print on that new shirt. Something that rewards, emotionally bonds, and provides consumers with an individualised personal experience. When looking for suitable incentives, it quickly becomes clear that discounting doesn’t work. All price reductions do is to deteriorate brand equity. What is needed is a way of adding value for both brand and consumers alike: added value sales promotion campaigns with lifestyle incentives are a powerful tool to achieve just that. How about you tell your customers that with every purchase over $100, they will receive a free return flight ticket to one of 30 destinations? There you have it all: travelling has long been an expression of lifestyle. Consumers can choose where to go, so they can express their individualism. The experience of having been travelling will from then on be emotionally connected to the brand. The customer now has a strong emotional bond to the brand. All this creates perfect foundation to grow valuable brand advocacy. Because ultimately, this is what we want. Customer satisfaction is not enough. We can keep ourselves busy with measuring customer satisfaction across stores and e-commerce sites, but as a competitive differentiator, it will not help. What actually makes a difference is the quality of the customer experience, i.e. how well does it address consumer values? A satisfied customer will happily give a 5-star rating for a product, an emotionally bonded customer however will tell all their friends about the brand experience as a whole. It is estimated that these brand advocates spend around 10 times more than a merely satisfied customer. Certainly nothing anyone wants to miss out on. The bottom line is that no matter whether it is new or established fashion brands, online or high street fashion retailers: If you’re selling apparel you’re offering experiences, if you want to sell more of the same, offer more of the same. Right now, there is no better way to achieve this than with lifestyle travel incentives. For every dollar spent on incentive travel, there is a $12.50 increase in revenue. Amidst the ongoing boom in global aviation, free flight campaigns take a distinct role here. Specialised agencies can offer them as one-stop solutions and at competitive prices, providing excellent ROI. These types of campaigns are an excellent opportunity for retailers and brands to get in tune with their consumers. Just like each apparel purchase is a manifestation of the consumer’s identity, each purchase can at the same time be a sustainable manifestation of the brand identity. Not any, but one that resonates with consumer’s values. If you want to maximise customer value and sustainably gain market share for your apparel brand or retail business, don’t miss out: get on board now.